1999 started it all. The 90,000 people who jam-packed the Rose Bowl, Mia Hamm’s worldwide popularity, the dramatic penalty kicks, Brandi Chastain’s iconic photo. The “99ers” will always be the ones credited for Women’s Soccer exploding in America. If you’re not too familiar with them, I suggest the ESPN Film “NineForIX” documentary. As for the 2015 Women’s National team, hopefully by now you’re all too familiar with these ladies. World Champs again, with probably the most dominating onslaught of goal scoring I’ve seen on this big of a stage since Manchester City drowned Manchester United 6-1 in the 2011 Manchester Derby. Sixteen years ago, there is no way you’re making a Women’s Soccer reference to the most competitive soccer league in the world. Indeed, the ladies game has come along in leaps and bounds and with this core group of players hitting their prime, there’s no reason not to keep believing they can sustain this dominance. Ever since Chastain buried her penalty kick on that scorching Southern California day, the women’s national team has had its ups and most certainly their downs. They have played some classic games along the way, such as the 4-3 semi-final victory in the 2012 Olympics against Canada, when Alex Morgan “123 minute header stands as the latest goal in a FIFA competition. They went on to win the Gold Medal in front of 80,000 strong in Wembley stadium along with a NBC record 4.5 million viewers, numbers that even the men of the English Premier League rarely reach. There is the time in the 2011 World Cup when Abby Wambach sent home one of the most beautiful (and most clutch) passes from Megan Rapinoe against Brazil, a game they eventually won in a shootout, sending them to the Final. And of course, there were the valleys as well. Losing to Japan in heart-breaking fashion in 2011, or going back further when they were picked apart 4-0 by Brazil in the 2007 World Cup semi-final, the beginning of the end for life after the “99ers” as Hamm, Lilly, Scurry, Foudy and the 99ers had played their final World Cup. They were in dire need of a new identity to shape the team moving forward. Oh, did they find one. She has been the face of United States Women Soccer for much of the 2000’s, if not all of it. She has led the resurgence and the rise of the women’s game all the while picking up nearly every accolade possible. Except the big one. She fell short in 2003 against a superior Germany alongside Hamm, and in ’07 in China as the leader of the group, she couldn’t pull through as they fell short once again. 2011 looked like the year, it felt like it. Abby now had the help of a younger and talented generation in Morgan, Rapinoe, Solo and Leroux. Her goal against Brazil (the one mentioned above) stands as the signature moment of this new generation of women soccer players taking command in the public eye. Although they lost in the final, they appeared on every late night talk show, SportsCenter and attendance grew in the NWSL. At last, she finally has the one thing missing in her trophy case. Amongst the two Olympic Gold Medals, her 183 International goals (most all-time by any soccer player, men or women) or her 249 Caps from her lustrous 14-year career for the U.S. is that World Cup title. She was outspoken, she was brash, her game was built on toughness, hustle and grit. She is a winner in every sense of the word and has done it on every level now. Abby Wambach was the identity. At 35, she has most certainly played her final World Cup, but her influence on the younger generation is profound. That may be her greatest achievement yet. If you grew up playing competitive sports, you understand what sweet revenge is like. The satisfaction of that victory meaning more because of the heartbreak suffered before. Japan shattered a story-book ending for the U.S. Women in 2011, especially after Wambach’s miracle goal that got them there. You could tell this final was personal, regardless of what was said, a statement was going to be made. Four freaking goals in 16 minutes. They lit Japan up like the 4th of July. Carli Lloyd thrashed them on a perfectly executed set piece and pass from (of course) Megan Rapinoe, a scramble play in the box and just the casual bomb from midfield to go along with an absolute stunner from Holiday on the volley. I can’t think of a better way to get revenge on an opponent than to win before the game even starts. But the U.S. dominance spanned the entire tournament. They were just six seconds away from breaking Germany 8-year record for longest shutout in a Women’s World Cup at 540 minutes. While all the talk might have been about where the U.S. offense was all tournament, the backline and Hope Solo were nothing short of a brick wall. The U.S. are the shining program in the women’s game, having finished in the top three in every single Women’s World Cup to go along with the fact that they haven’t lost a gold medal in the Olympics since receiving a silver medal in the 2000 games. Don’t think for a second the championship belt is going anywhere anytime soon. Morgan, Rapinoe, Leroux, Press, Heath, Holiday, Johnston and Klingenberg are all amidst the primes of their careers and were all key contributors en route to the World Cup title. The team Wambach leaves behind is very much in good hands. The American Women are light years ahead of the men in terms of international success, having already achieved three World Cups. Yet, fan interest in both arenas has grown exponentially nationwide. Sunday’s Final was the most watched soccer game (for both men and women) in United States history at 25.4 million viewers. And if you count in the Telemundo viewers (at 1.3 million viewers) it exceeds the amount of the men’s Final between Germany and Argentina last year. Last year, I wrote about how the men’s game has spawned incredible amount of interest in soccer throughout the country, with enormous crowds packed into parks, football stadiums, restaurants and bars to watch the games. This year it was no different for the women, as Chicago and Kansas City once again put on huge watch parties for the Final against Japan. As far as marketing goes, these women are some of the most marketable athletes in America. Alex Morgan jerseys are selling out faster than they can be produced. This group is fun, young and talented. The trifecta as far as marketing athletes go, men or women. Look at that crowd Sunday, there weren’t just little girls in attendance in Vancouver but grown men and women with their faces painted in the red, white and blue. 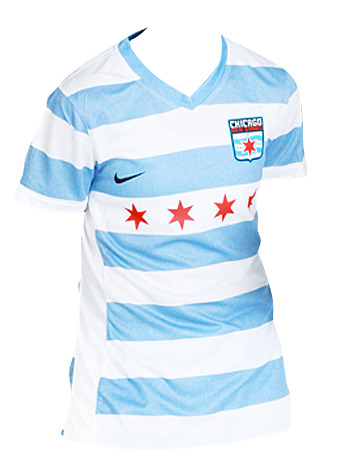 For goodness sake even I own a women’s soccer jersey, and everywhere I go it always receives the response of, “Where the hell did you get that?” Probably because it is one of the best looking jersey’s in all of sports. As far as women getting as much of a slice of the pie (in terms of salary) as the men do, there is plenty of work to be done. The fact that FIFA was so adamant about not changing from artificial turf to natural grass is absolute blasphemy. FIFA showed no respect to all these women. When Abby Wambach said, “The men would strike playing on artificial turf.” She has a strong argument. Not only is there an increase in injuries, but it can get up to 20-30 degrees hotter on an artificial pitch. FIFA make billions each year (and we all know now millions have been launder illegally) FIFA alone made an astonishing $4 Billion from the 2014 Men’s World Cup, if they can’t spend the coin to have the Women’s World Cup played on natural grass (KEEP IN MIND WE ARE TALKING ABOUT THE MOST IMPORTANT PART OF THE GAME, THE FIELD) then FIFA deserve every penalty they have coming towards them, although they deserve it regardless. So yes, there are still numerous problems that persist for the women’s game which deserves better, but this conversation is finally taking place, as there wasn’t even a league in 1999 when U.S. Women’s Soccer exploded onto the scene. There is much to look forward to for the U.S. Women, as their dominance is just the beginning of more to come. So let’s party like it’s 1999.